This book provides evidence-based answers to the key questions asked by marketers every day. Tackling issues such as how brands grow, how advertising really works, what price promotions really do and how loyalty programs really affect loyalty, How Brands Grow presents decades of research in a style that is written for marketing professionals to grow their brands. It is the first book to present these laws in context and to explore their meaning and application. The most distinctive element to this book is that the laws presented are tried and tested; they have been found to hold over varied conditions, time and countries. This is contrary to most marketing texts and indeed, much information provides evidence that much modern marketing theory is far from soundly based. 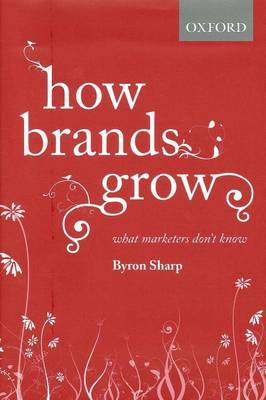 Professor Byron Sharp is the Director of the Ehrenberg-Bass Institute for Marketing Science at the University of South Australia. The Institute's fundamental research is used and financially supported by many of the world's leading corporations including Coca-Cola, Kraft, Kellogg's, British Airways, Procter & Gamble, Nielsen, TNS, Turner Broadcasting, Network Ten, Simplot, Mars and many others. Dr Sharp has published over 100 academic papers and is on the editorial board of five journals. He recently co-hosted a conference at the Wharton Business School on laws of advertising and, with Professor Jerry Wind, is editing a special issue of the Journal of Advertising Research on the topic.